We’ve probably been here 15 times yet the shock remains. Our daughter has leukemia. Isabelle fluttered around more cheerfully than usual. She hopped up onto the scale for her weight. Then she willingly let her height measured. Accessing the port shed a few tears but that’s normal when you stick a needle in a kid. One of the brightest spots and in our day was our child life specialist. Our child life specialist for today, Krista, was wonderful as always. While the nurse explained what she was doing, Krista make sure we all we’re doing OK. She played a “Super Why” video for Isabel while she was getting stuck. I pulled Krista aside as Ashley and Isabel walked to the patient room. I learned something surprising on the way over to Riley. More than 90% of the pay for child life specialists came from donations, and not insurance. I asked her more about her job. Krista explained that her job is to make sure parents and patients are really doing OK. She gets to look in on in care for everyone in their total experience. Personally, it was a child life specialist who took Isabelle from us to her port placement surgery. They have a real special place in our hearts. 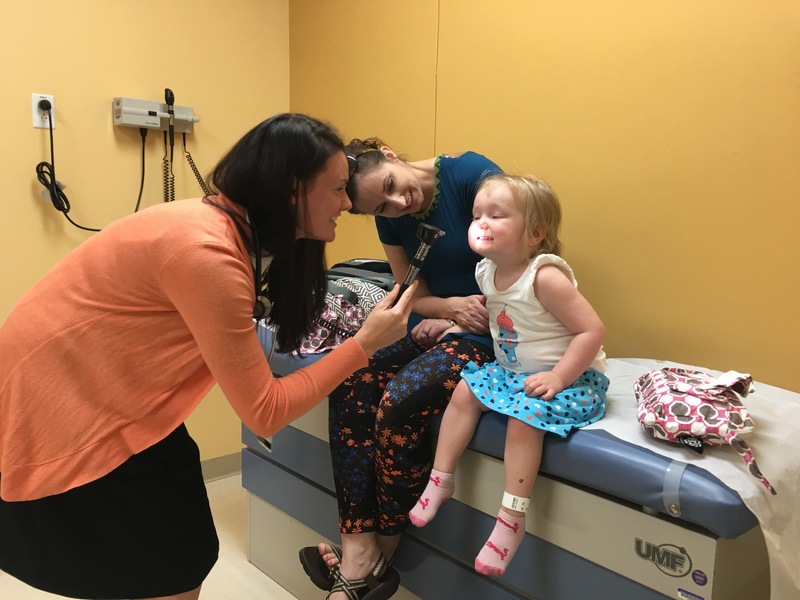 Krista also said, “I love how I can check in on patients without asking whether something will be covered by insurance.” Since most of her pay is funded through donations to the Riley Children’s Fund she has the flexibility to care for kids well. Without it being an issue of what the insurance will cover. Ashley and I have battled depression and tears over the last several months. Child life specialists have been massive in our time at Riley. I think Krista and went to join Ashley and Isabelle. Waiting for the doctor we managed to play hide and seek in a 9 x 9 patient room. It’s pretty impressive what you can do rearranging three chairs in a tiny room. Isabelle climbed everything in the room. Good news! Isabelle’s blood counts remained higher than we thought they would. This means her immune system is still functional. A quick check up with the doctor completed and we got sent home. We start a new phase of treatment next Tuesday. Another normal week, another day at Riley Children’s Hospital. Arriving in Terre Haute we picked up Christy from a friend and came home to enjoy dinner donated by another friend. We ran out to catch a quick half of a Rex baseball game. Now Ashley and I sit exhausted and weary from the grind of living with Leukemia. Ashley and I live grateful to many friends. After today we are also grateful to the work of the Riley Children’s Foundation for providing people like Krista. Ashley and I also live drained by the burden and pressure of this battle. Hi Daniel, I came across your post and wanted to say that Riley is such an amazing place! I am a Riley kid myself and have been all of my life. The Child Life Specialist are amazing and I to am inspiring to be one. Currently, I am going to school to become a CLS. I also wanted to say that I think it is amazing that you follow Christ. My faith is very important to me and I love reading blogs that share the same faith as yourself. Lastly, I just wanted to wish you and your family the best of luck. You couldn’t be at a better hospital and God has all of this in the palm of his hands. Hang in there!